Yark Subaru Quick Buy allows you to appraise your trade-in, apply for financing and more from the comfort of your own home. Thanks to Yark Quick Buy, we can ensure that our customers are comfortable picking out the vehicle that's right for them. Once you've finished some of the preliminary steps online, like estimating the value of your trade-in and personalizing your payments, you can visit our Subaru dealership in Toledo, OH, to finance a new, used or Certified Pre-Owned Subaru! 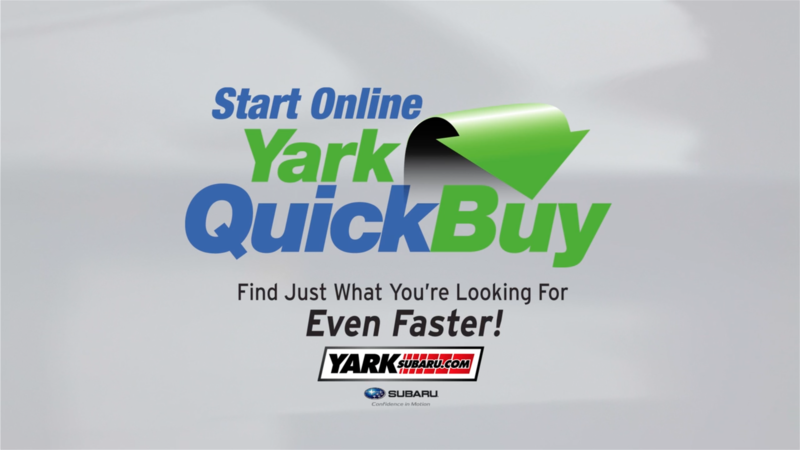 Yark Subaru Quick Buy is fast and designed to make the car-buying process as simple as possible. Your budget is going to be unique to your needs and lifestyle, which is why we make it easy to customize your auto payments. Whether you're applying for an auto loan or lease, you can see what options are available. Then someone from our Subaru financing team can meet with you in person to go over the different interest rates and what financing option would be best for you. Yark Subaru makes the trade-in appraisal process easy with our online estimates. Simply give us some information about the car, truck or SUV you currently drive and we'll let you know roughly what it's worth. When you visit our Toledo Subaru dealer for a test-drive, one of our sales experts can look over your vehicle and give you the final offer, helping to lower the price on the new or new-to-you model you'd like to buy. Apply for Subaru financing at Yark Subaru and qualify for the Subaru Forester lease or Impreza finance rate you need. Once approved, you can visit our Subaru dealership and meet with a financing expert who can go into more detail about the different options you're eligible for. We make leasing or buying a new Subaru easy at our dealer! Once you've completed these steps you're almost ready to drive home in a new Subaru! Schedule a Subaru test-drive to discover which model is right for you, and then our sales and finance experts can walk you through the rest of the car-buying process. Contact Yark Subaru if you have any questions!